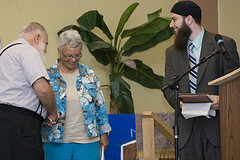 In commemoration and memory of Sept. 11, the Islamic community of Tampa aligned with Christian and peace-centric organizations from throughout Tampa Bay to break bread and speak on how a multicultural humanity copes with horror and what action, as an entire people working across lines of belief and conviction, can be taken to restore dignity and community abroad. These are the wounds of an entire nation and culture, and one must wonder if they are healing. “9/11 happened to us all,” a featured speaker said in a video presentation from the Council for American-Islamic Relations. It was that sentiment which encapsulated the event: the boundaries of faith and politics were exceeded by the will to foster a sense of cosmic unity. Hassan Shibly, executive director of CAIR Tampa, desires a world that is unbridled by fervent nationalism and bigotry, where diversity and humanity are essential. “Let us unite today and say no to those who wish to justify violence and hatred to our brothers and sisters in humanity ...,” he said. A decade of expansive warfare has engendered his passion. “Is a life worth less because of the passport it carries?” he asked. Shibly and CAIR seek a brighter tomorrow on the horizon. Shibly proposed a three-step initiative to be taken to restoring not only America, but also nations and peoples beyond that were affected by the attacks: providing proper healthcare to the first responders at the World Trade Center, a unity of country via compassion and understanding, and an immediate end of warfare. Shibly identifies this benevolence as universal in the teachings of prophets and figures from Abrahamic faiths and beyond: “If we are more concerned when our children are hurt and starving, but less concerned when our neighbor’s children are hurt and starving, then we are not true believers,” he said.